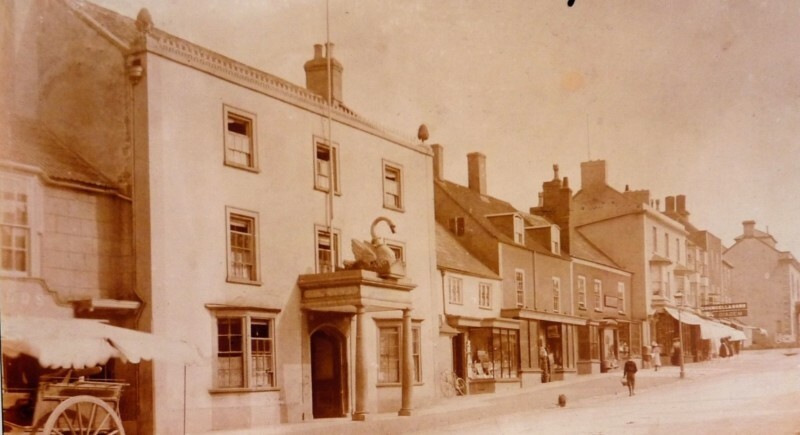 According to English Heritage, The Swan in the High Street in Thornbury has mid 17th Century origins and was remodelled and extended in the late 18th Century. Certainly we have found records in Stafford Record Office that confirm that the inn appears in a court roll of 1633 showing tax was payable by “John Thorne for the Swan in Thornbury lately built new.” Click here to read about its early history. Although to the modern reader this would appear to mean that The Swan was built in 1633, it is equally likely to indicate simply that it was extensively modernised at that time. Today The Swan has a very striking presence. It is especially noticeable for its large porch and big white columns that go far out onto the pavement. On top of the porch is the famous swan. The present swan is a simple modern version, made of fibre glass and placed there in 1988. The original bird is shown in this photograph on the left and in more detail below on the right. As can be seen from these photographs it had a gold collar round its neck with a chain hanging from it and it is is seated on a bed of “rushes”. When the original wooden swan crumbled and needed to be replaced, the then owners sought advice about the design for its replacement from Slimbridge Wildfowl Trust. The Trust naturally provided a realistic design for the bird but did not appreciate the historical significance of the emblem. According to CAMRA ‘The Swan’ is the fourth most common name for a pub in Great Britain but in this case the emblem of the swan may have some local significance. Meg Wise of Thornbury Museum has done some research into the name of this pub and she believes that its name and its original emblem with the gold collar and chain are references to the House of Lancaster, specifically to the de Bohun family. The de Bohun family claimed to trace their family history back to the legendary Swan Knight (the hero of Lohengrin). The family’s emblem of a swan was a reference to this legend and it was adopted by Henry IV after his marriage to the wealthy heiress Mary de Bohun. By 1374 Mary de Bohn’s equally wealthy sister and co-heiress, Eleanor de Bohun had married Thomas of Woodstock, Duke of Gloucester and Earl of Buckingham. Their daughter Anne of Gloucester married three times. Her second husband was Edmund Stafford, 5th Earl of Stafford. Their eldest son was Humphrey Stafford, first Duke of Buckingham. The Stafford family as Earls of Stafford and Dukes of Buckingham were also Lords of the Manor of Thornbury. 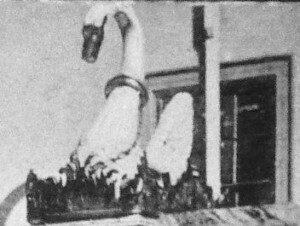 The Swan was adopted as one of the emblems of the Stafford family because of their link with the de Bohuns. As the Lords of the Manor of Thornbury owned this inn it might be no coincidence that it adopted the sign of The Swan. The parapet of The Swan (as can be seen from the photograph above) is also eye catching as it is adorned with two large pineapples, one on either end. These might give an indication of the social aspirations of the business in the eighteenth century as at that time the pineapple represented not only hospitality but wealth and social status. We haven’t seen the deeds of this property. We are fortunate however that the Lords of the Manor of Thornbury owned The Swan up to 1834 and therefore this part of the inn’s history is recorded in the Manor Court Rolls. From the record of 1633 previously mentioned, The Swan was regularly referred to by name in the early records of Thornbury properties. In some sources it was the only inn specifically mentioned. This means that it has been an important landmark in Thornbury since the early 1600’s and is probably the longest continuously running inn in the town. Its pre-eminence may possibly be explained by the fact that it was owned by the Lord of the Manor and was located close to the Market Place. However these cannot be the only factors in The Swan’s success. The Lord of the Manor also owned the White Hart on The Plain and this is hardly mentioned in any of the earlier records. There were also other pubs equally close to the Market Place. Its success may also stem from the generous provision of stabling and other public rooms which allowed it to be used for a wide variety of functions. The Manor Accounts also provide some information about the appearance of the building at various times. For example we know that in 1739 some or all of its roof was thatched. The Accounts for April 22nd 1740 show that 18s 6d was spent on thatching work at The Swan. We also know that in 1795 there was a list of maintenance work done on The Swan such as buying a sweeping brush to clean the house at The Swan, paying for the woman to do the sweeping, paying a man for pitching the grate, paying Thomas Lippiat £1. 5s for unspecified work there and most interestingly paying “Dyer and Collett” for the sign plate and painting The Swan. We do not know the reason for this flurry of work. It is possible that the property was being prepared for a new tenant. It could even be an indication that the frontage of The Swan was altered around this time. It seems likely that The Swan was once built around a open court. It is possible that the end of the court nearest the High Street was closed off when a new front was added to the building in the late eighteenth century. The open area within the pub was still visible on the 1840 Tithe Map. A small section of this map is shown on the right hand side. Please click on it to see a slightly larger version. This space was later incorporated into the building and is now fully enclosed with a glass roof. However it is possible that it was once possible for a coach or someone on horseback to enter this courtyard area from the High Street. The present doorway and porch appear to make this impossible. We believe that these additions and indeed the whole frontage of the property were added some time in the late eighteenth century. The property continued to be accessible via St Mary Street into the rear of the premises by horses, coaches and other vehicles. The entrance from St Mary Street remains to this day. Another feature of the pub seems to show that it was easily accessed on horseback. George Ford’s book called “Thornbury Pubs” describes the ‘Georgian bow-shaped window in what was the courtyard, with a high level window within a window” and he explains that it “allowed drinks to be passed to horse riders without them dismounting”. The back of the pub also has some unusual features. There are three plaster panels set into the rear walls, showing a rampant horse or unicorn, a lion and unicorn with crowned thistle and rose above, and another animal which could be a lion. We have a small photograph here on the left which shows one of the panels. We cannot give an explanation of what they represent. It was once thought they were fire plaques but such plaques were affixed to the wall when the owners of a building paid the fire insurance but they are not usually etched into the fabric of the building. Meg Wise believes that they might have been carved into the plasterwork when The Swan took on an official role such as when an upper room acted as the Excise Office for Thornbury. However we have no evidence for this theory at the moment. Certainly if this room was used as the Excise Office it was probably more often accessed through the rear of the building rather than through the pub area and so it might make sense for the rear of the building to have such a mark. In the absence of detailed records we cannot say what The Swan was like up to the end of the 18th Century. However the nineteenth century newspapers contain lots of evidence to show the The Swan in its heyday provided the Town with a wide variety of functions. We have records showing that during this period it was coaching inn, posting house and excise office. It was the meeting place for the Corporation, for organisers of charitable trusts, for the County and Manorial Courts and for the meetings of the Court Leet. It offered accommodation for those wishing to stay overnight, and meals and other refreshments. It was also the centre of social life in Thornbury, catering mainly for the more respectable people of the town with regular dances, concerts and property auctions held there. It was also the meeting place of the Ancient Order of Oddfellows. The Swan was used for many years as the local office of the Excise man. Our earliest reference to this role was in a document dated 27th April 1796. The document appointed James Vaughan as ‘the Deputy Agent and Officer for keeping the Office of Excise at the sign of The Swan in the Town of Thornbury. James was running The Swan at that time. His duties involved the collection of excise dues from ‘all common brewers, distillers, rectifiers, victuallers, inn-keepers, ale-house keepers and other sellers and retailers of beer, ale, cider, and perry, sweets, and of all other excisable liquors, makers of vinegar, mum, sweets, metheglin, and mead for sale; and also by all maltsters and makers of malt, hop planters, and by all makers of candles, sope, starch, paper, paste-board, mill-board, and scale-board; and by all printers, painters and stainers of paper and by all printers, painters and stainers of silks, calicoes, linens and stuffs; tanners, tawers, curriers, and dressers of hides and skins, and pieces of hides and skins, makers of velum, and parchment; and by sellers of, or dealers in brandy or tea; makers of glass; makers of bricks and tiles; and by all dealers in, or sellers of wine, by wholesale or retails‘. The Swan continued to be used as the Excise Office throughout most of the 1800s. Other Excise Officers based at The Swan include Joseph Wilson and Thomas Wright (both in Trade Directories for 1839). The directories of 1839 and 1842 refer to The Swan ‘Posting and Excise’ and we note that in 1889 it was still being used in a similar way then as an Inland Revenue Office. However it is noticeable that the trade directories for 1895 and 1897 say that the then Excise Officer, Walter Emery, was to be found at The Plain. With the exception of James Vaughan we have no evidence that any other landlord of the Swan combined his duties of running the inn with those of an excise man.